Behold the Bold Umbrellaphant: And Other Poems. By Jack Prelutsky. Illustrations by Carin Berger. Greenwillow, 32 pp., $17.89. Ages 3 and up. For more than six months, a review of Jack Prelutsky’s collection of sports poems has appeared repeatedly among the top 10 posts on this site. I wish the distinction were going to a worthier book than Good Sports, which has uninspired rhymes, clichéd language and art that’s mismatched with the text. Prelutksy’s 2006 Behold the Bold Umbrellaphant is in every way superior to it. This sparkling collection of poems about imaginary animals pays its respects to Lewis Carroll’s “The Crocodile.” (“How doth the little crocodile / Improve his shining tale, / And pour the waters of the Nile / On every golden scale!”) Because “The Crocodile” was a parody of an Isaac Watts poem, you might call “Behold the Bold Umbrellaphant” a parody of a parody. But Prelusky’s book isn’t a parody so much as an homage. Like “The Crocodile,” most poems in “Behold the Bold Umbrellaphant” use the ballad stanzas known as common meter or “hymn” stanzas, or alternating lines of iambic tetrameter and iambic trimeter with rhyming first and third lines. And Prelusky stays close enough to Carroll’s work that his book could have become a tired imitation of it. Will preschoolers will get the puns and other wordplay in poems like “The Lynx of Chain”? Wrong question. 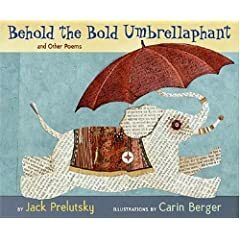 Like Carroll’s “Jabberwocky,” Behold the Bold Umbrellaphant is nonsense verse, a form that uses whimisical or incomprehensible words to comic effect. And not the least of the virtues of this book is that it may help to prepare children to appreciate Carroll and other masters of that vanishing art. Best poem: Many, including the lines from “The Panthermometer” and “Behold the Bold Umbrellaphant” quoted above. Caveat lector: The second and fourth lines should be indented four spaces in the lines quoted from the title poem, “Behold the Bold Umbrellaphant,” but this template won’t let me do that. Children’s book reviews appear on Saturdays on One-Minute Book Reviews.